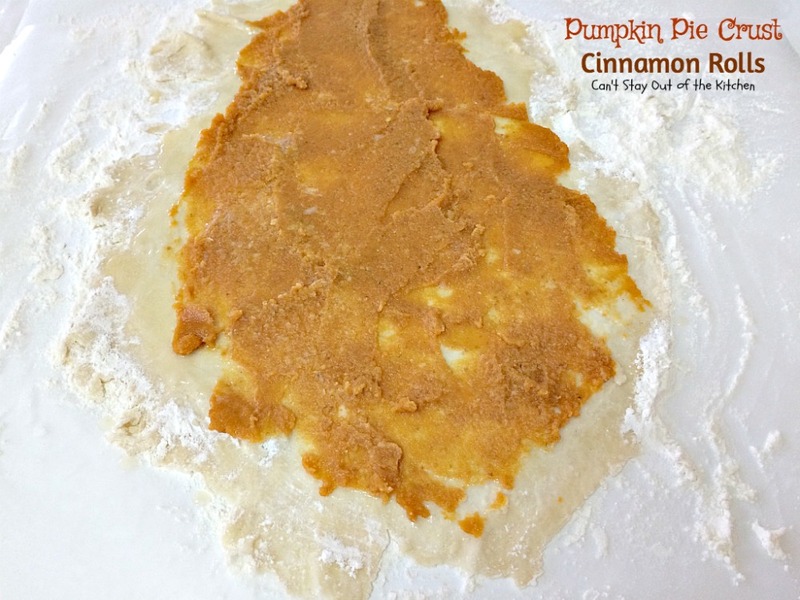 Pumpkin Pie Crust Cinnamon Rolls are divine! Truly. These lovely cinnamon rolls have a pumpkin filling sprinkled with cinnamon, sugar and pumpkin pie spice. The filling is rolled up in my Mom’s excellent Homemade Pie Crust and then baked to perfection. Yum. After cooling these rolls I slice them down to serve. 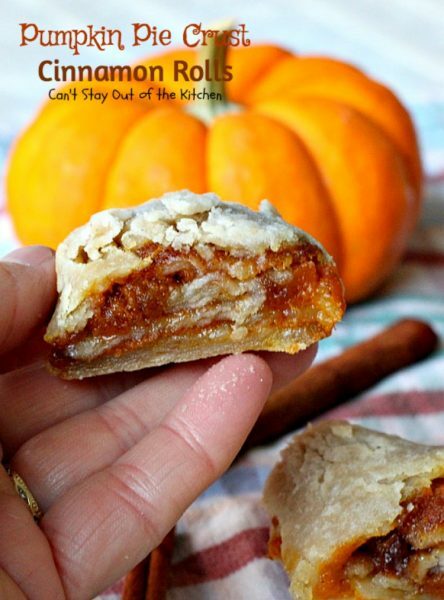 These drool-worthy miniature pumpkin pies are sensational, especially if you enjoy pumpkin as much as I do. 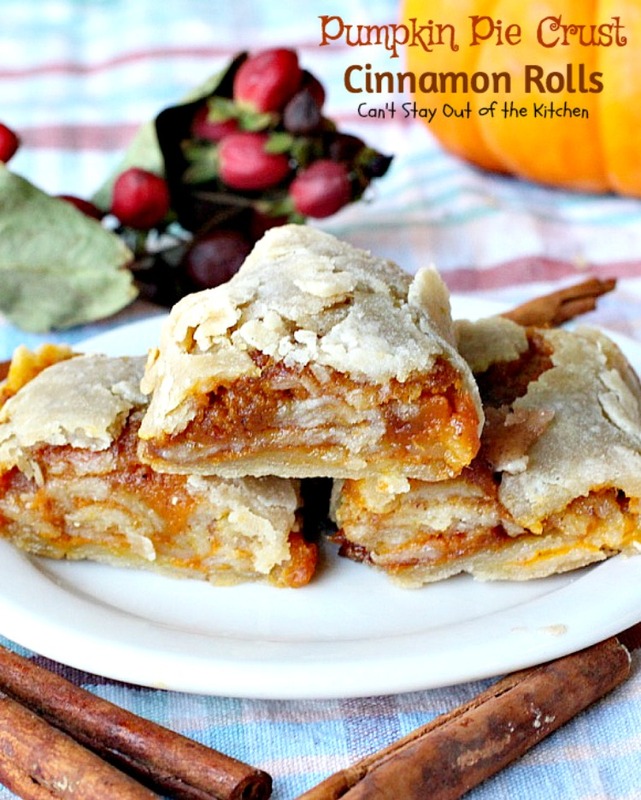 When I was a little girl, my mom would make Pie Crust Cinnamon Rolls almost every time she baked pies for dessert. Mom made desserts for every dinner meal when I was growing up so I grew up with a huge sweet tooth. 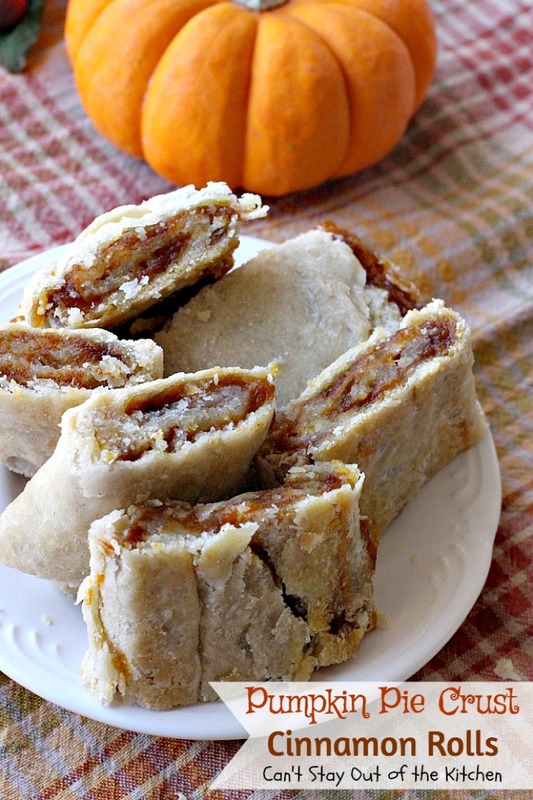 Any leftover pie dough was made into these rolls. My brothers and I would fight over them when we got home from school. If we weren’t fast, ALL of the rolls would be gone in a snap. I always wondered why mom didn’t just make up about 3 or 4 batches of the cinnamon rolls at one time instead of just one, but that’s how it usually was. Mom didn’t make hers with jelly or jam. I discovered that idea from Debbie Reno Pero when we lived in Massachusetts. She made some of these cinnamon rolls with a prune filling which was delicious. After that, I started making these cinnamon rolls with jellies as well. 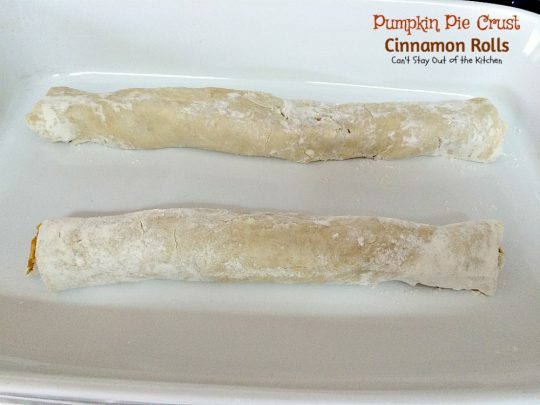 I love making Pie Crust Cinnamon Rolls and I’ve made lots of different kinds through the years including Red Raspberry, Strawberry, Apricot and Peach. Any kind of jelly fillings work wonderfully, but pumpkin is excellent, too. Even puddings can be used. These rolls are great for breakfast, as an after school snack or even tailgating parties. They are like eating miniature pumpkin pies and absolutely dissolve in your mouth. I made a couple of batches of these cinnamon rolls last month. I made one batch for my son who flew in from Pennsylvania for a few days, and about a week later I made another batch for construction workers on our new house. I try to take goodies to the workers who are there for several days at a time. This batch went to the guys bricking the outside. They were gobbled up really quickly. By the time I finished looking at all the new things done on the house inside and came back outside, the cinnamon rolls had been eaten up! Pumpkin Pie Crust Cinnamon Rolls are heavenly. Pumpkin Pie Crust Cinnamon Rolls are great for breakfast or snacks. I used these ingredients for the filling. I also used Homemade Pie Crust to wrap the filling in. 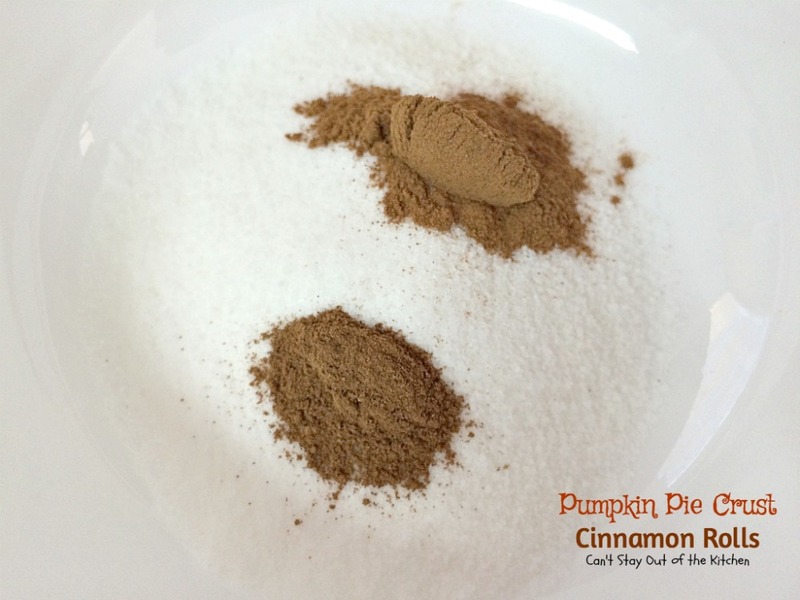 Combine sugar, cinnamon and pumpkin pie spice. Roll pie crust dough out into a circle. Melt butter and spread on top of pie dough. Spread pumpkin across the dough in a thin layer. 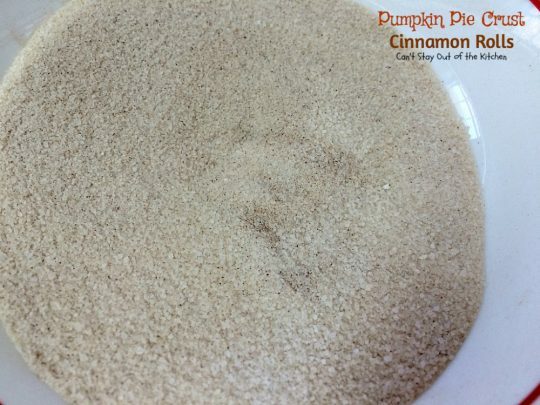 Sprinkle cinnamon mixture over top of the pumpkin layer. 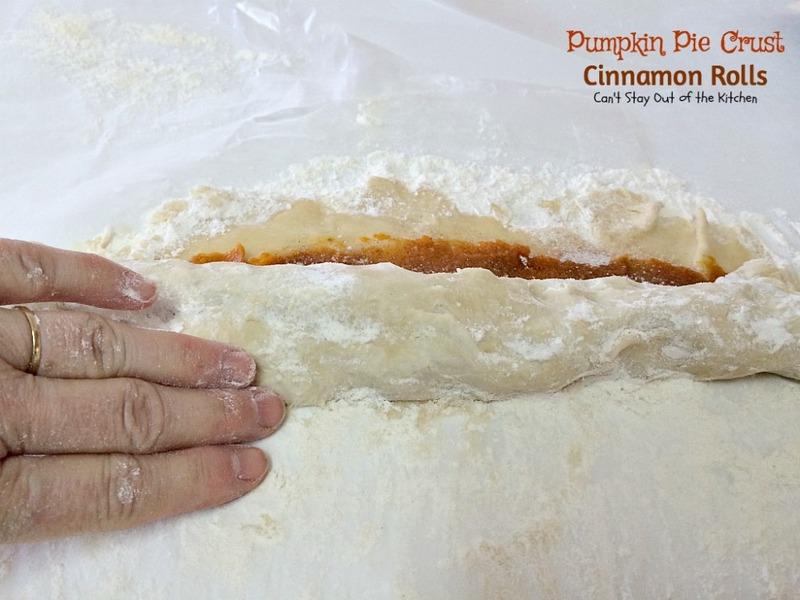 Begin rolling up pie dough very carefully and gently. 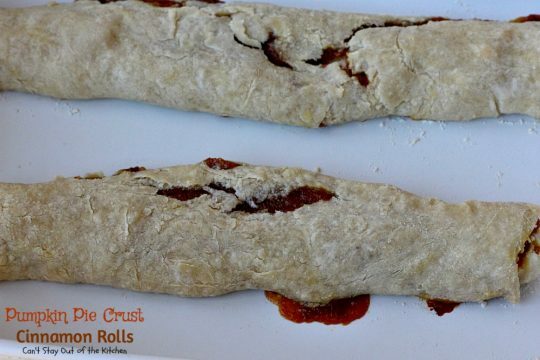 Fold in the sides, continue rolling up dough. I tucked a little flour into the dough and rolled up gently so there wouldn’t be cracks in the dough. Tuck the end piece in and then roll the dough over the end piece so the edges are all sealed. Place on lightly greased cookie sheet or in baking dish. Bake at 350 for about 20-30 minutes or until lightly browned and crust is cooked. Slice down rolls in one- or two-inch slices to serve. If you enjoy pumpkin you’ll love these miniature Pumpkin Pies! 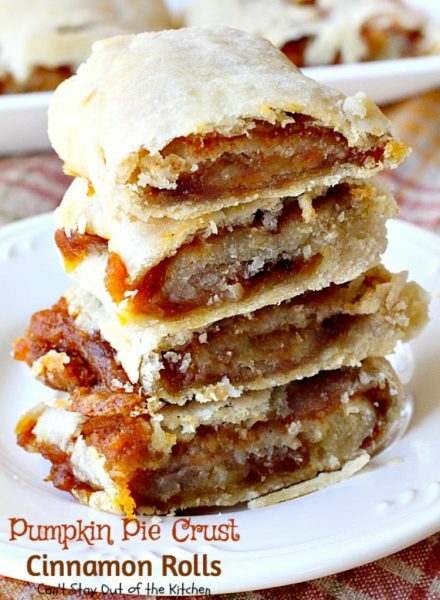 These delicious cinnamon rolls are filled with pumpkin, cinnamon and pumpkin pie spice and taste just like eating miniature pumpkin pies! Fabulous for a holiday breakfast. Roll out pie dough into 2 rectangular forms. 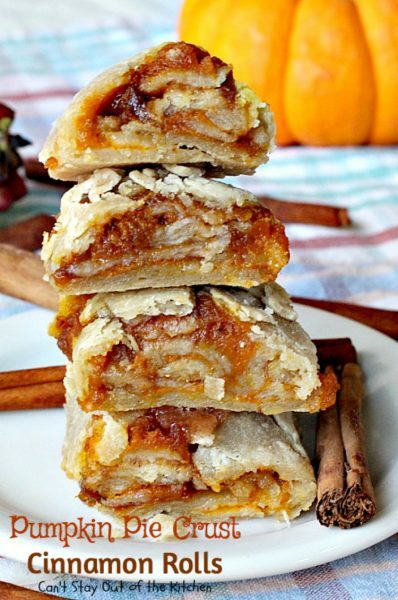 With a regular knife, spread a thin layer of pumpkin over top of the butter on each rectangle. Depending on the size of your rectangle, this will take about ¼ to 1/3 cup for each. Combine sugar, cinnamon and pumpkin pie spice and sprinkle evenly over top of pumpkin. 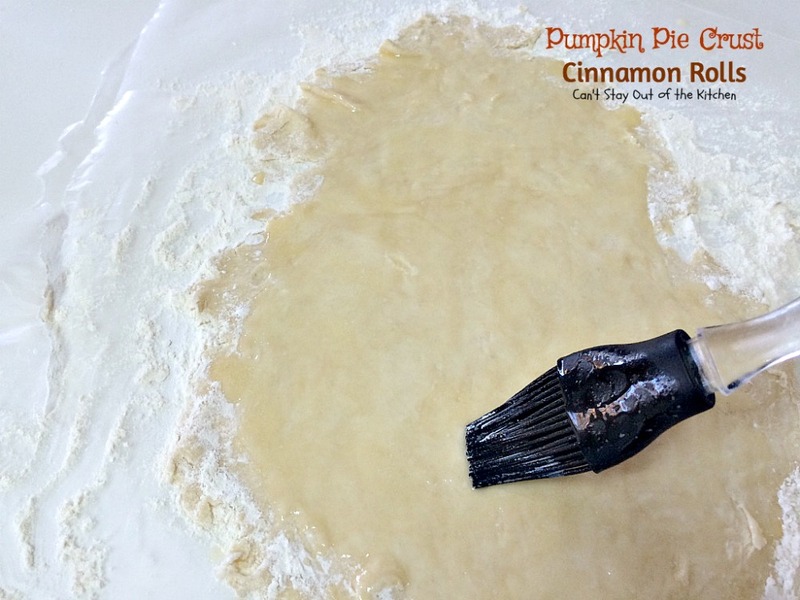 On one of the wide ends, gently roll up pie crust. After the first inch or so, tuck in the sides and continue rolling. Before you get to the end, tuck in the wide end and roll completely. This will keep the pumpkin from seeping out of the pie dough. Place in glass baking dish and bake at 350° for about 20-30 minutes or until pie dough has cooked through. Yield: each roll yields about 8 cinnamon rolls. 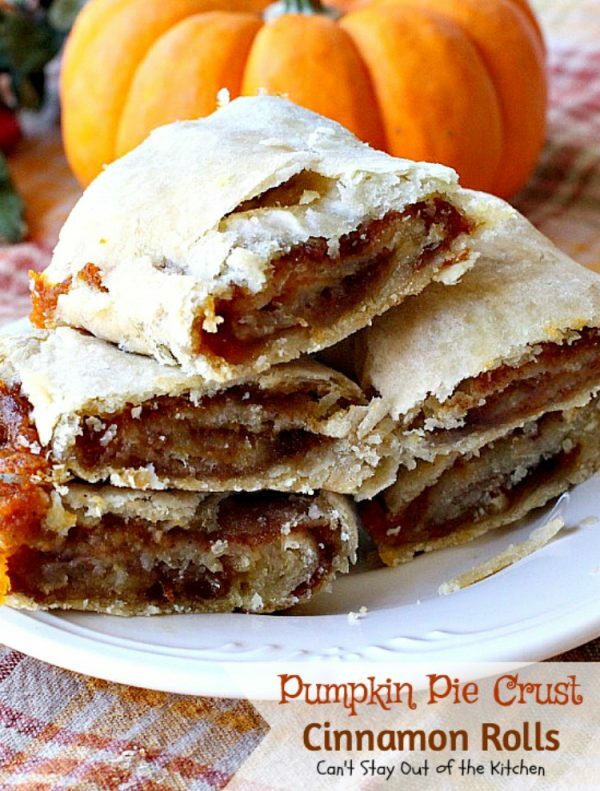 NOTE: I usually use leftover pie dough for this recipe and make as much as I have leftover dough for. 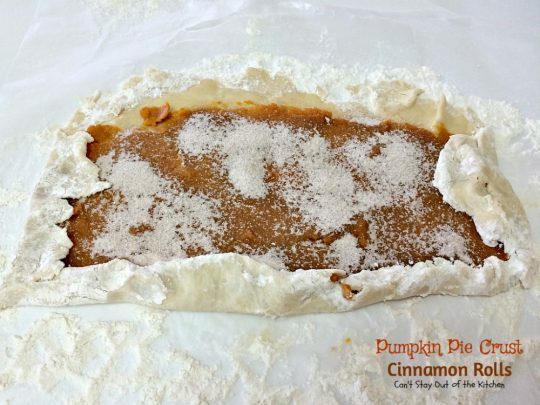 NOTE: You do not have to be exact with the butter, pumpkin or spice measurements, but if you put too much on the roll, it will all expand while baking and most of it will leak out of the roll. NOTE: Preparation time does not include time required to make and roll out pie crust. 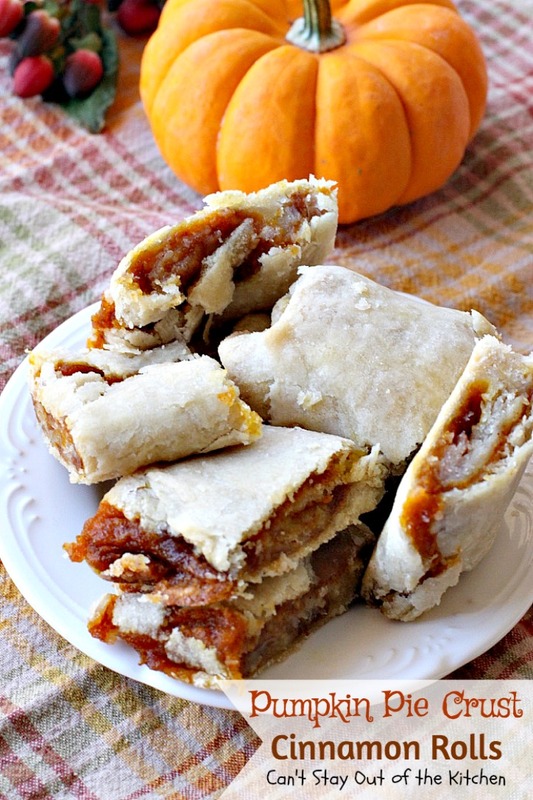 I usually use leftover pie dough for this recipe and make as much as I have leftover dough for. 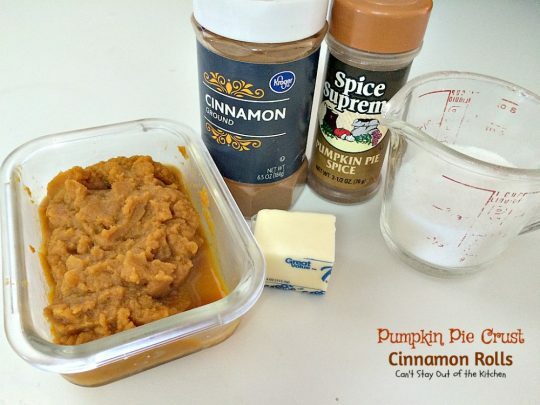 [br][br]You do not have to be exact with the butter, pumpkin or spice measurements, but if you put too much on the roll, it will all expand while baking and most of it will leak out of the roll. 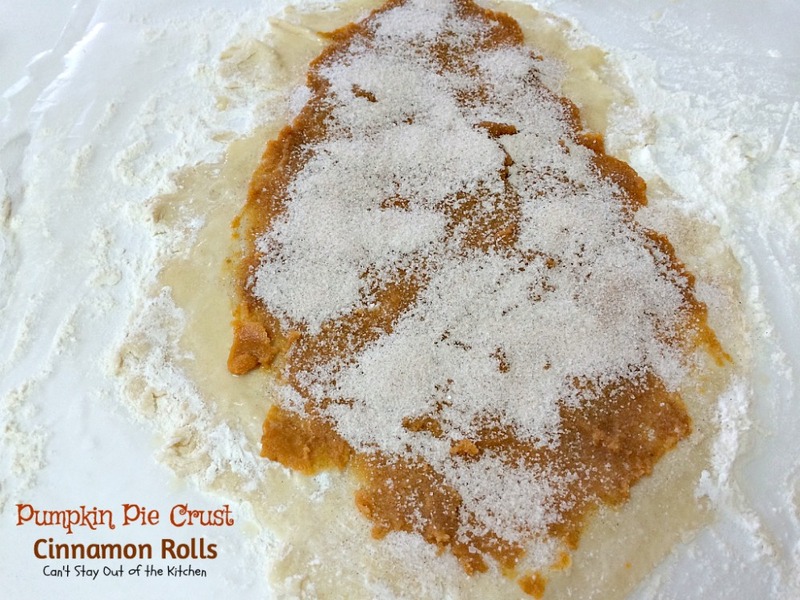 [br][br]Preparation time does not include time required to make and roll out pie crust. 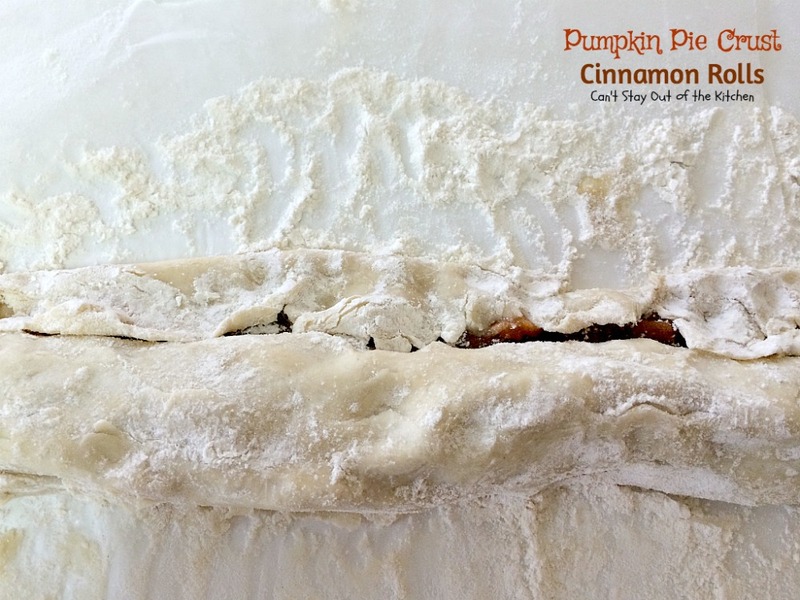 Pumpkin Pie Crust Cinnamon Rolls are wonderful for a holiday breakfast like Thanksgiving! I loved the way these cinnamon rolls tasted.